Denmark Street contains many original 16/17C cottages which are now shops. 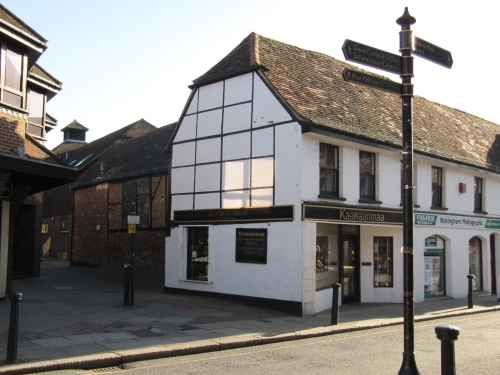 No 22 is a grade II listed building, believed to be the "Old Oakingham Whurkhouse" (now Kaanaamaa jewellers). However, records are scarce and the earliest reference to date is a 1776 inventory by Benjamin Beaver. Further evidence does occur later in the century, but with some confusion as to the exact location. The building is a fine example of an early 16thC timber framed structure with later brick infill, altered in 17/18thC, but retaining its interesting architectural features. The small window in the passageway on the NE side on the first floor is said to be where bodies of the dead were lowered to the street below beyond the gaze of the the inmates. The workhouse was believed to consist of three premises - one with one room up and one down (no fireplace), two with one room down and communal sleeping upstairs. A fireplace existed in the kitchen, with a small side building for washing. Water was drawn by pump. The buildings would have been maintained by a Master. In 1776 between 16 and 22 inmates were catered for with few beds, most sleeping on the floor. The inmates from Denmark Street were moved to the new workhouse in Barkham Road (now Wokingham Hospital) sometime after that was built in 1849, along with inmates from Wargrave and Swallowfield.